A Long Day at the Track but Worth the Wait! Today was the race weekend tuning day at Barbagallo Raceway, but unfortunately when we arrived at the track the weather was pretty ordinary! Heavy rain in the morning and then again at lunchtime meant that there was a great deal of water on the track, and not being very warm, there didn’t seem much hope that we would get any laps in at all! However, around the middle of the afternoon the rain stopped, and with the wind picking up, the track finally began to dry. A little before 4pm, everything sprung into action, Brett had the car ready and before you know it Homan Ho (the winner of the last State Round) and I were out on the track together. 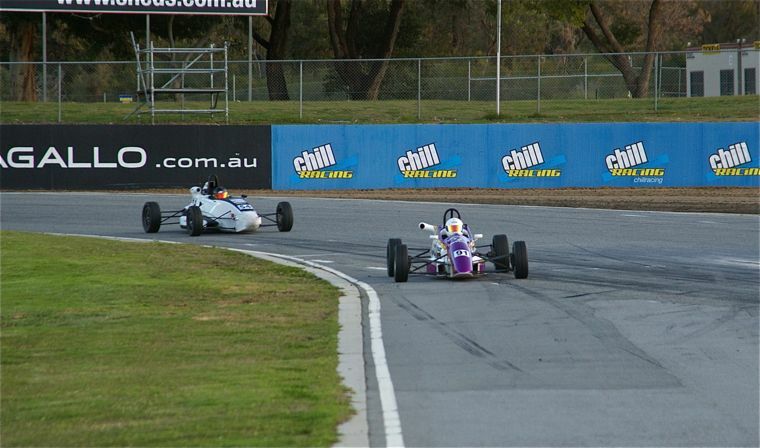 I was really pleased with my driving, times were pretty good, and thanks to Brett the car felt fantastic. In the end, I had a really good session with Homan, and now I can rest up, and relax a bit tomorrow before being at the track bright and early Sunday morning! ← Race Weekend Program Update for Calan Williams!